The spring edition of the Kirchdorfer News just arrived! This latest issue presents a number of interesting reports, comprising the entire Group. The special focus of this issue revolves around our complex and complete quality assurance, guaranteeing an extraordinary product quality throughout the entire Group. Learn more about our railroad competence from the British channel to the Panama Canal and read about how Kirchdorfer made children happy on the 3rd children’s day of the Upper Austrian Industry. We wish you an enjoyable and informative reading pleasure! 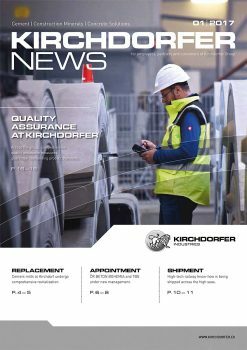 12/2018: Your Reading Pleasure for the Christmas Season: The new issue of Kirchdorfer News is out now! 03/2017: Get to know us!